Christmas is a time of vast opportunity for businesses and customers alike. Christmas represents the end of a year and the beginning of another and is often a time where your customers will be planning the projects that they want to complete in the coming year. The excitement of a new year and the reflection on the unfulfilled plans of the previous year, combined with the expectations of Christmas sales culminates in a buzzing period of activity that represents a fantastic opportunity for you to reach new customers. With this excitement comes uncertainty for your customers. Many businesses operate reduced, or altered opening hours over the festive period, so most customers are a little apprehensive about getting in the car to visit your store without some reassurance that you will be open. 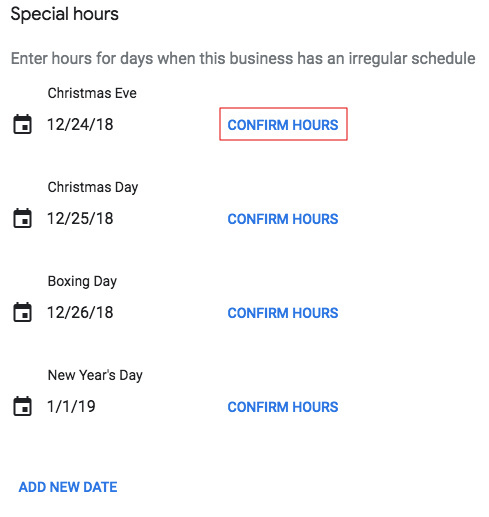 Fortunately, there are some really easy steps that you can take to update your Christmas 2018 opening hours using Google My Business. 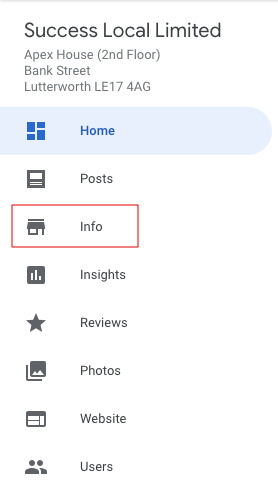 In this post, we’ll provide you with a step by step guide to updating your own Google My Business page to reflect special opening hours. 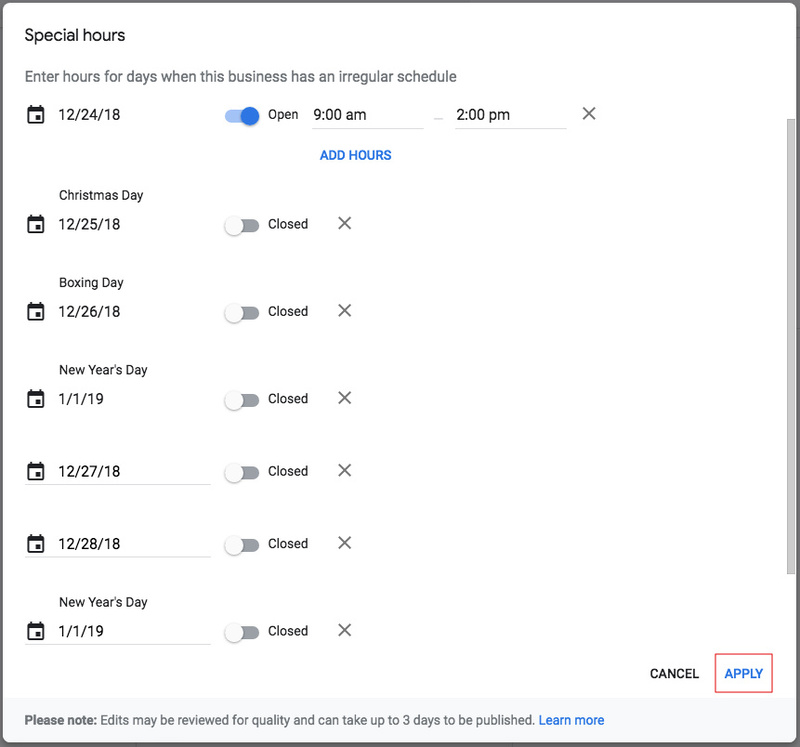 1 – First, you’ll need to log into your Google My Business account and select the location you want to add your hours for. Once you’ve done this you’ll reach your overview page which has a menu down the left-hand side of the page. Select “Info”. 2 – Next, you’ll need to find you special opening hours section. This will be below your usual opening hours and above your telephone number. Once found, select this. 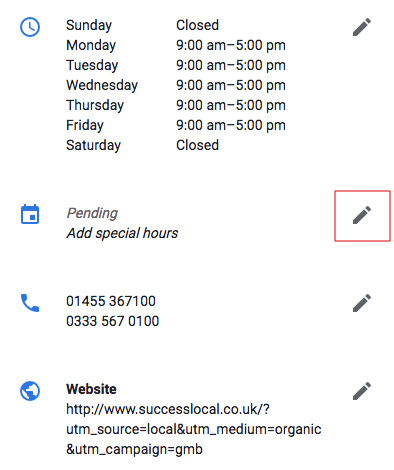 3 – By default, Google will automatically suggest some dates that they think are likely to be subject to special opening hours. To confirm your opening hours on these dates select “confirm hours”. 4 – Once you’ve done this you will be able to toggle whether you are open or not and also what your hours are on that day. 5 – To add a date that isn’t inputted by default, select “add a new date”. You will need to select this to add special hours for the period between Boxing Day and New Year’s Day. 6 – Once you’re happy with your hours select “Apply”. 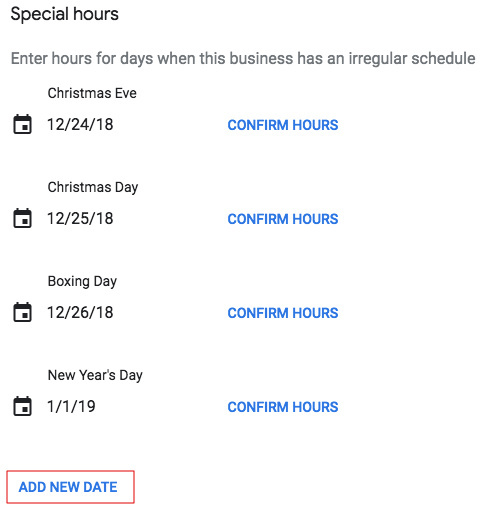 By following these steps your Google My Business page will automatically display your special hours on the dates you’ve selected. These hours will appear in search results for your business. We’ve also included a video guide of the process below. For assistance with your Google My Business page, please contact the team at Success Local on 01455 367 100.